New York City in itself is a cultural melting pot of food. 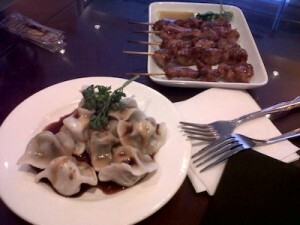 Within just a few blocks, you can enjoy authentic Chinese fare and then move onto decadent, homemade Italian desserts. I’m talking about downtown NYC and exploring Chinatown and Little Italy. Nina and I decided to explore these two areas and check out the food offered. 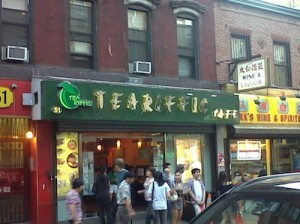 We started off in Chinatown where we enjoyed some fabulous bubble tea at Teariffic. This was such an adorable hot spot. It’s a great place to come to when you’re looking for some tasty snacks, cool drinks and a light atmosphere. Nina ordered the cold almond milk tea and I ordered the cold coconut milk tea. 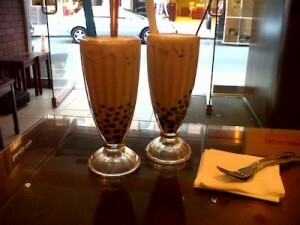 Soon, we were both sipping on tall glasses of milky goodness filled with black tapioca pearls. The tapioca is a great surprise when sipped up through your chunky straw, providing a chewy texture. Both of our teas were refreshingly light and sweet with a strong flavor of almond and coconut. While sipping on our teas we both shared an order of Skewered Yakitori Chicken, which is thinly sliced chicken, skewered and grilled. The chicken tasted slightly sweet and smoky. We also enjoyed an order of Steamed Vegetable Dumplings. These were little, delicious purses of steamed dumplings filled with shredded carrots and cabbage. After some wonderful conversation and delicious tea and appetizers, Nina and I decided it was time to move onto something sweet! Luckily, we were minutes away from Little Italy (it was right down the block!). 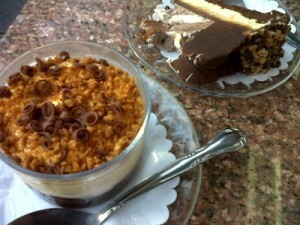 So, we decided to enjoy some authentic Italian desserts at La Bella Ferrara. This is where we sat in the evening breeze and had some truly decadent Chocolate Vesuvius Cake and a Coppa Mascarpone. The Chocolate Vesuvius Cake had a chocolate cake base followed by a layer of cheesecake with a ganache chocolate decoration and topped by milk chocolate mousse. Now, if that does not get you drooling, the Coppa Mascarpone will certainly do the trick. The Coppa Mascarpone has a layer of rich chocolate sauce, followed by creamy mascarpone and topped with chocolate shavings and a malted crunch. These two desserts alone will make you feel like you’re in heaven! This entry was posted on Thursday, June 9th, 2011 at 9:15 am and is filed under Food, Tasting the World in NYC.